Ever since we had our first weekend of Lakeland 100 recce runs in April when we covered Dockray to Ambleside and Ambleside to Coniston I’ve been looking forward to getting back on the route to complete the circuit. 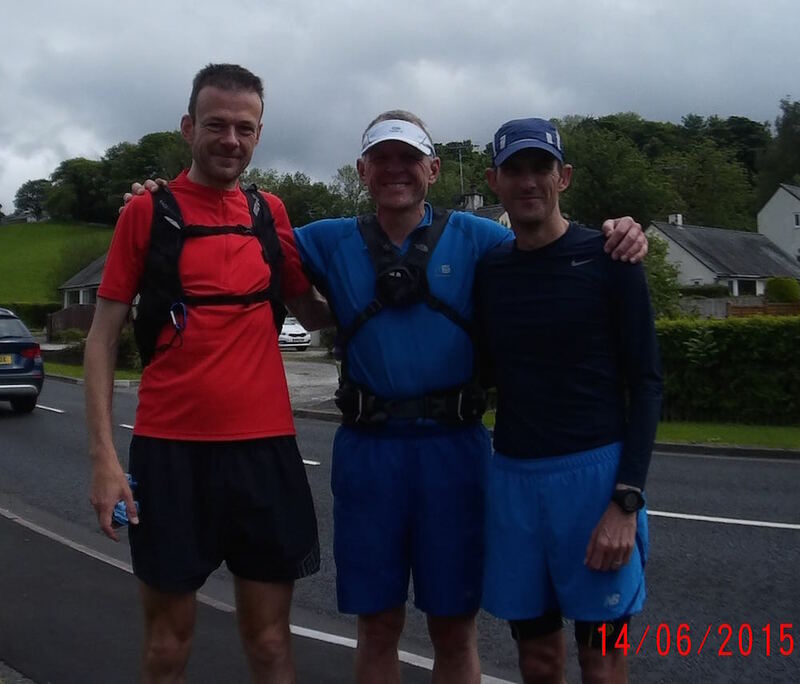 This time last year’s Lakeland 100 winner and good friend Marco Consani was joining Dave, Jonny myself for the two days. Jonny was a little apprehensive with the thought of running with such ultra-stars (he didn’t mean me!) but I knew Dave & Marco would be happy to run together and enjoy the route and time on feet. Marco and Jonny left their cars at my house in Paisley and we drove down in my car. Fortunately I had heard on the radio that the M74 was closed both ways just north of Gretna with 9 mile tail backs so thanks to Marco’s iPhone we decided to head down the M77, A76 and A75 and the journey was fine. I’ve not seen Marco since the World 24hr race in Turin so it was good to hear all about it though he obviously had a tough time! On the positive side Marco is loving being back on the trails and looking forward to defending his Lakeland 100 title! 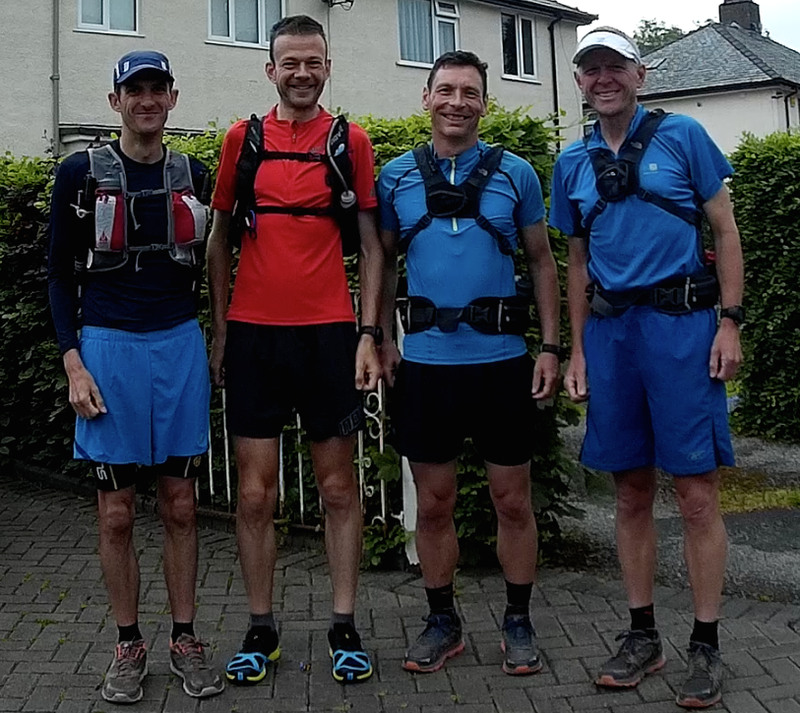 Once we arrived at Dave’s house in Keswick we continued our running chat before heading to bed as we had an early start. Logistics for this weekend were fairly straight forward. 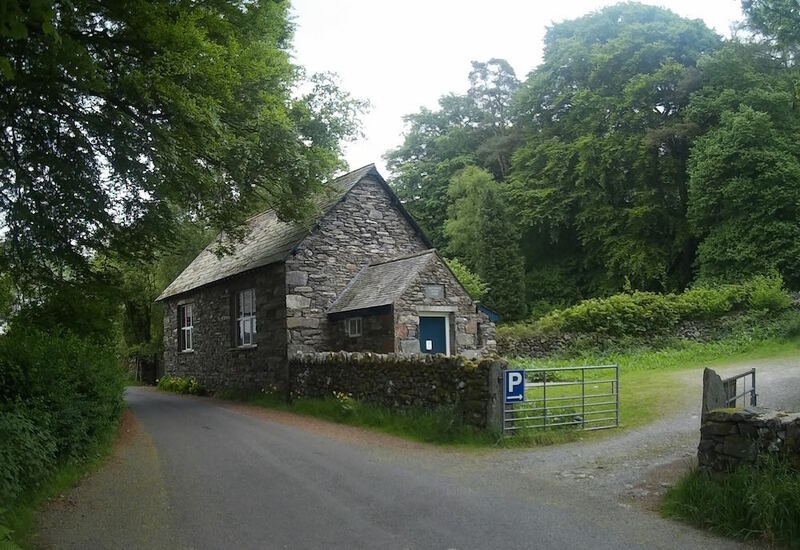 Catch the bus to Ambleside, wait 30mins, then catch another bus to Coniston. Start running just after 9.30am and run back to Keswick. Simple! Selfie at John Ruskin School, Coniston. The start of the Lakeland 100. 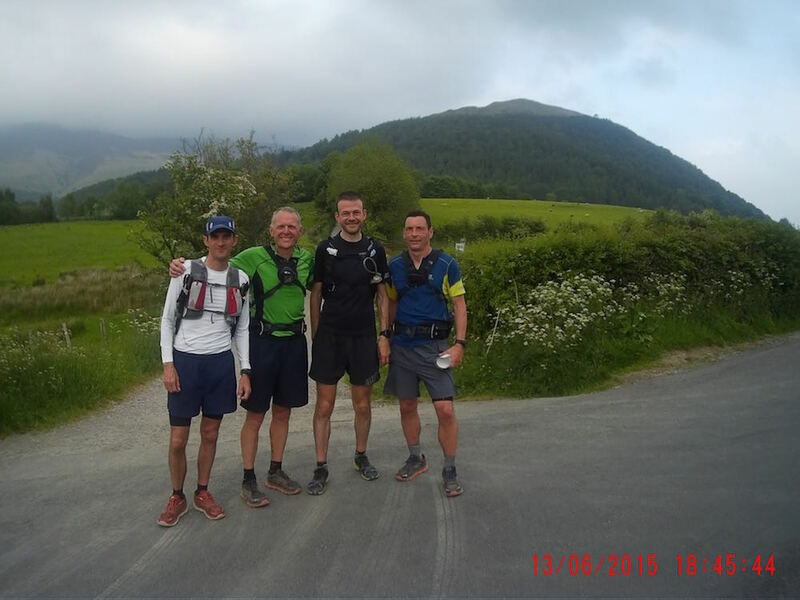 Dave, Marco & I have done the race before and reccied the route but it was all new to Jonny so we made sure he lead the way at all the key junctions so he could get his head around the way to go. He used the road book mainly which he found fine. 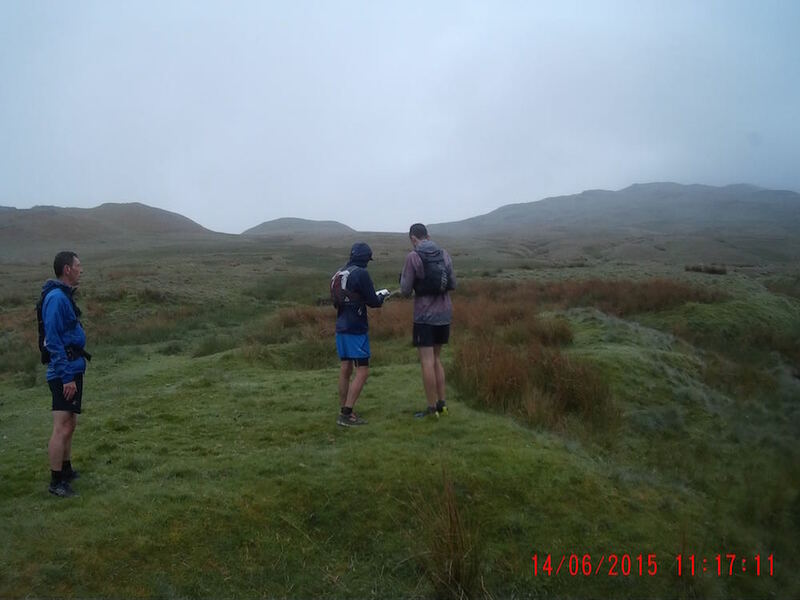 Jonny & I had also downloaded each leg onto our Suunto watches so it was good to check how accurate it is as you run. For the race I will have them ready but hopefully I won’t need to use them very often. If I’m unsure of any parts or the weather is bad is it’s good to know I have them and can call on them. It’s a long climb up to the top of the first hill out of Coniston and we were all chatting about our various strategies. It was really interesting to get a feel from Marco about where he is running and where he is walking. 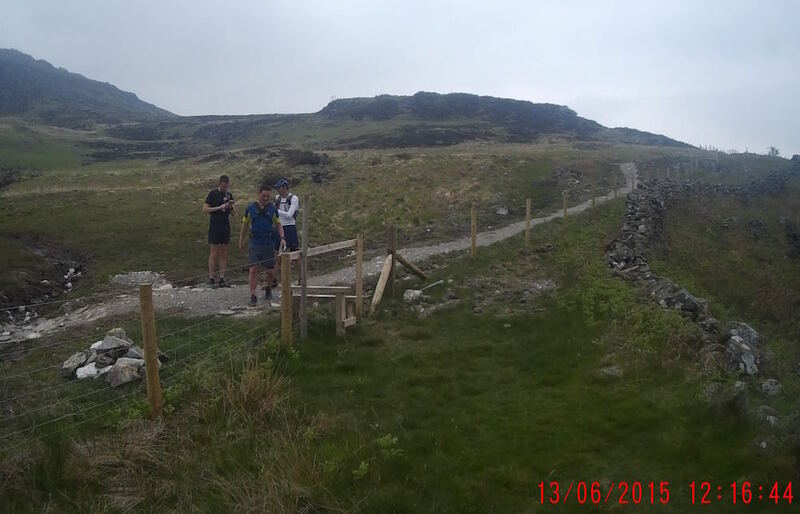 I like to have my mini-splits between each main checkpoint and my second one for this first leg is on the top of the col. We reached there in 1:09:33 which is about the time that Marco would expect to be at Seathwaite which is 2.5miles away down the hill!! For the race this year I’m going to go with my HR strategy so my splits aren’t so important but I like to have them as a guide to see how I’m getting on. I’m going to aim to keep my HR at 125 so it will be fun to see how long it takes me to cover the first 7 miles. I’m expecting to be well down the field but hopefully as the race goes on I’ll work my way through. That’s the plan anyway! The route out of Seathwaite changed last year so we were relying on Marco to show us the way. He didn’t seem completely sure and as the weekend progressed this because a regular mantra! So much so that we seriously wondered how he won the race and how much time he could take off if he was confident about the way!! I remembered the section after the farm with the noisy dogs as being really, really boggy. In 2012 my feet got really wet and never really recovered. It has all changed with the majority of the trees being felled and a new foot bridge. Also there is a new fence with a new stile. Marco thinks he went over the first one but we reckoned the second one further down was the correct one! The descent down to Boot was straight forward. The weather forecast had been for some rain but the day started well and in fact we didn’t have any rain at all which was a bonus. It was quite muggy though. We were so busy chatting that I forgot all about checking my mini-splits for this section!! That is most unlike me so I’ll have to assume they are okay!! 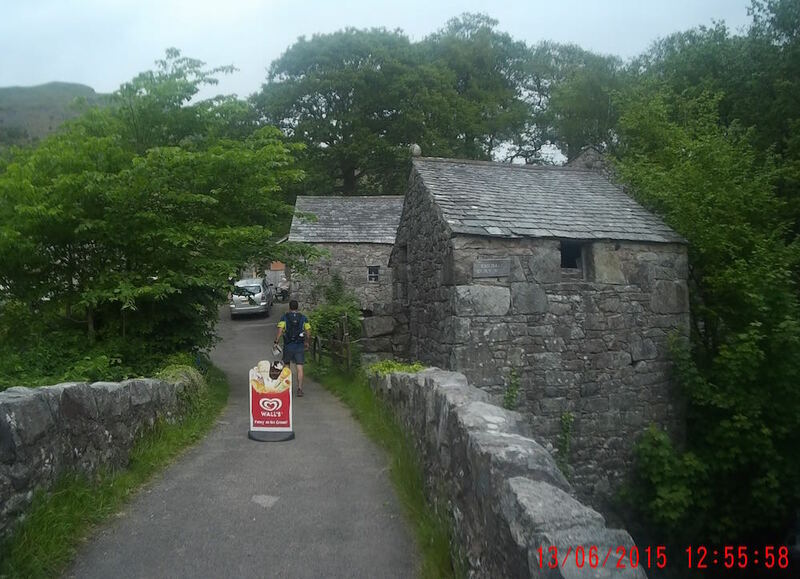 I really like the checkpoint at Boot with the stone bridge and small mill house. We stopped for a minute or so chatting to a guy who lives there and knew all about the race coming through. He said last year he got up to find a few people sleeping!! We were all surprised as it’s only 14 miles into the race. Not quite sure what Marco is pointing at?? One of the things I wanted to try out on this run was Tailwind nutrition. In my interviews with Annette on the whwrace podcasts she mentioned how good she finds them. A guy called Mike got in touch having heard the podcast and said that he is distributor in the UK. Mike said I could have a pack of 10 assorted flavours to try out. My plan was alternate the Tailwind with my Matrix Energy Boost that I’ve been using successfully for the past couple of years. The first Tailwind one I tried was the lemon. It had quite a tart taste to it. I drank it fine but I did prefer the other flavours (Orange, Berry and Raspberry). I always find it hard to know what makes a difference to a run but I enjoyed drinking the Tailwind and I certainly felt strong throughout the weekend so will definitely be using them again. I also had some energy bars, Youghat covered peanuts and raisins and liquorice to keep me going. As we climbed up to the Tarn about Wasdale Marco ran on looking very comfortable and smooth. The rest of us were happy to walk up. Marco then waited for us before we dropped down to Wasdale. This worked well with Marco getting a good workout but still enjoying our company! We chatted about where it would get dark. 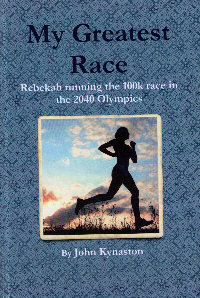 In the 2012 race that Dave & I did we started at 5.50pm and for me it was getting dark as I ran down to the checkpoint. This year the race starts at 6pm so I’ll need the heads torch on earlier. As we reached the valley at Wasdale there were a few folk waiting for friends who were doing the Bob Graham Round. One guy recognised me from my blog so I stopped and chatted for a minute or two and then had to catch up with the others. 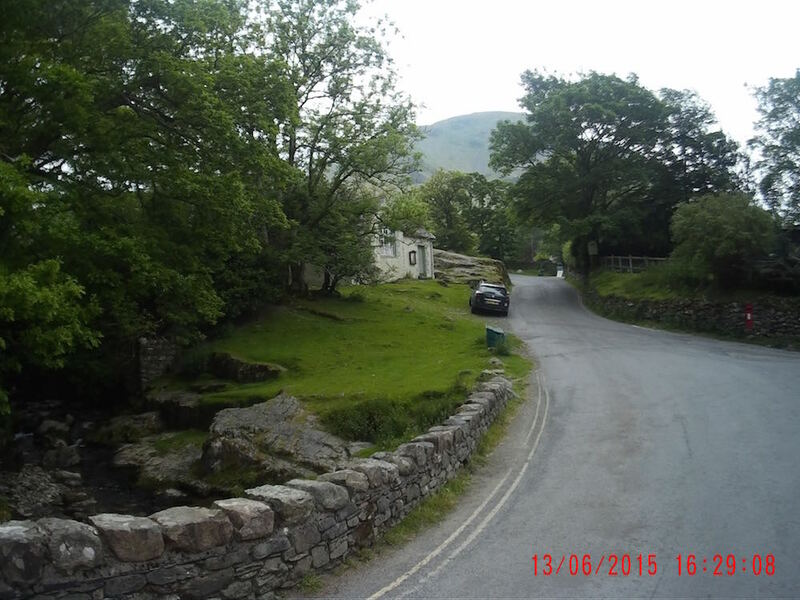 When I did the race in 2012 I reached Wasdale in 4:44:44. Today we were 4:34:59. I wanted to keep an eye on how it felt at various stages of the run so I could guage how hard I need to be working to be around my sub 30hr target. We tried to give Jonny a sense of what this checkpoint would look like. It is manned by one of the running clubs and they normally have a 70’s disco theme with large coloured wigs and outlandish flares. I’ll feel right at home! We headed up the hill in good spirits and settled into a steady pace. Marco was leading the way and soon pushed on. Half way up I asked Dave whether I could have a go with his poles sometime during the day. He very kindly said take them now. Dave gave me a quick lesson on how to use them to their best effect and I was off. I’ve never used poles before but if I do get a place in the UTMB I will definitely buy some and practise with them. It didn’t take me long to get used to them and I soon pulled away from Dave & Jonny. I’m not sure if I was that much faster with them but because I was concentrating on getting the technique right I was going quicker. We all re-joined together before the top and then descended to Black Sail Youth Hostel together. It can be a tricky descent especially in the dark. I remembered Dave’s tip from last time to listen out for the beck and keep close to the sound. We all agreed that it is best to take your time on this bit as the last thing you need is to twist an ankle with 85 miles still to go! 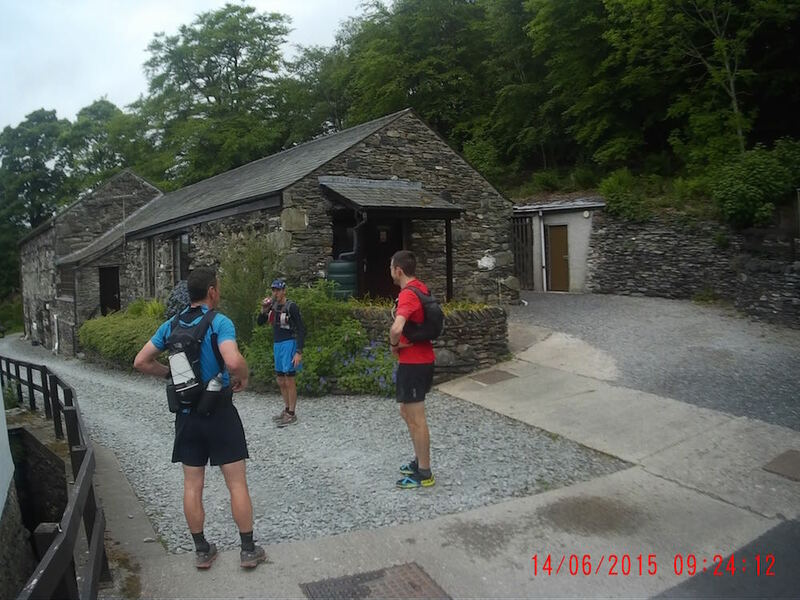 We all got down safely, ran past the Youth Hostel and headed up the next hill on our way to Buttermere. We saw a few runners out the hills and it looked like there was a race going on. It was quite warm by now so I was making sure I was drinking regularly. There are plenty of streams so I could refill my bottle. 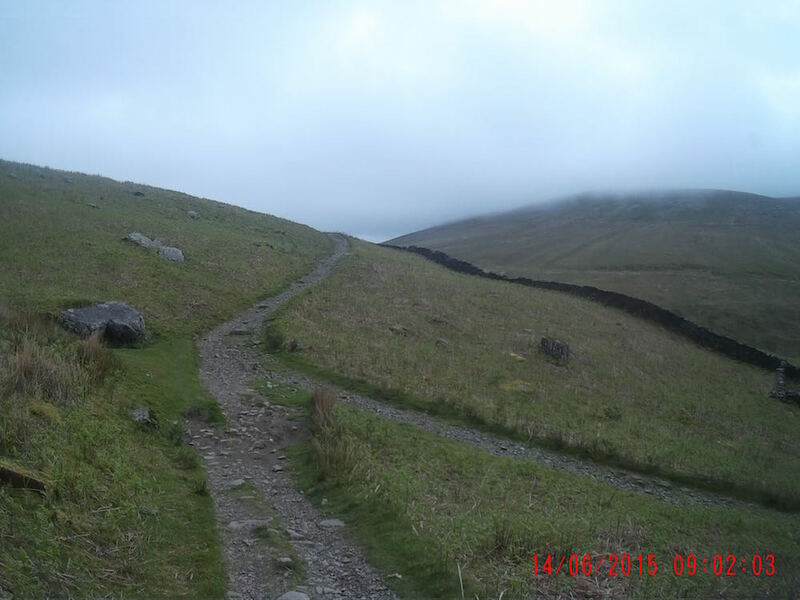 I love so much about this Lakeland 100 route, not least the variety of terrain you get to run on. 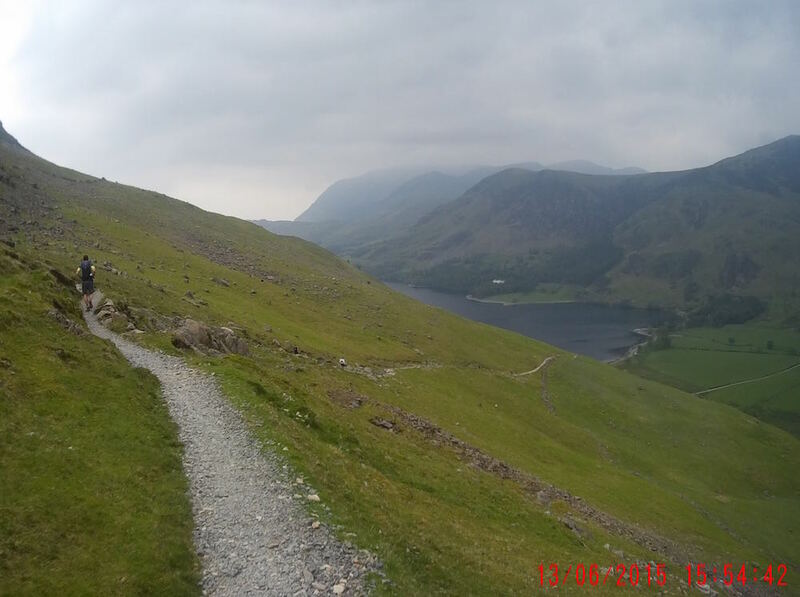 The path along Buttermere in the trees with the lake to your right feels relaxing after the last two climbs and rugged descents. 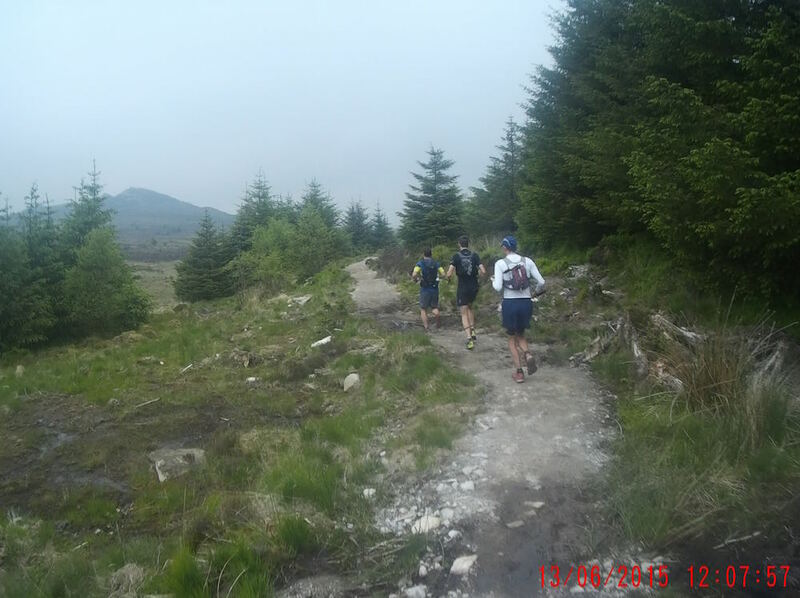 As we settled into a steady pace once again Marco and Dave pulled ahead as their steady pace is our tempo pace!! When they came to a gate Marco stopped and waited for us to go through. A real gent! I think I only opened a couple of gates the whole weekend!! We had a slightly longer stop at Buttermere for 6 mins or so. Jonny had the rice pudding he had been looking forward to and I tucked into my favourite Greek Style Youghat (strawberry flavour!). 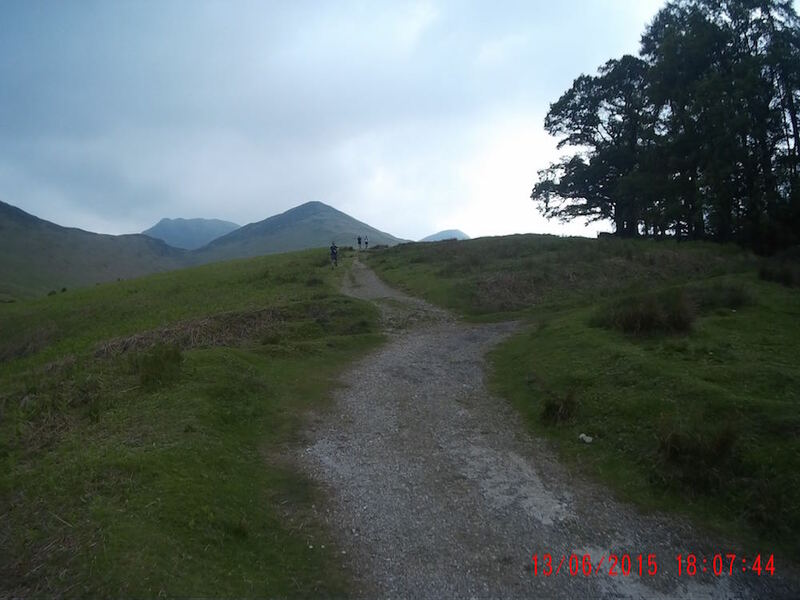 We had one more section to do to Braithwaite and then after extra 3 and a bit miles to Keswick to complete day 1. 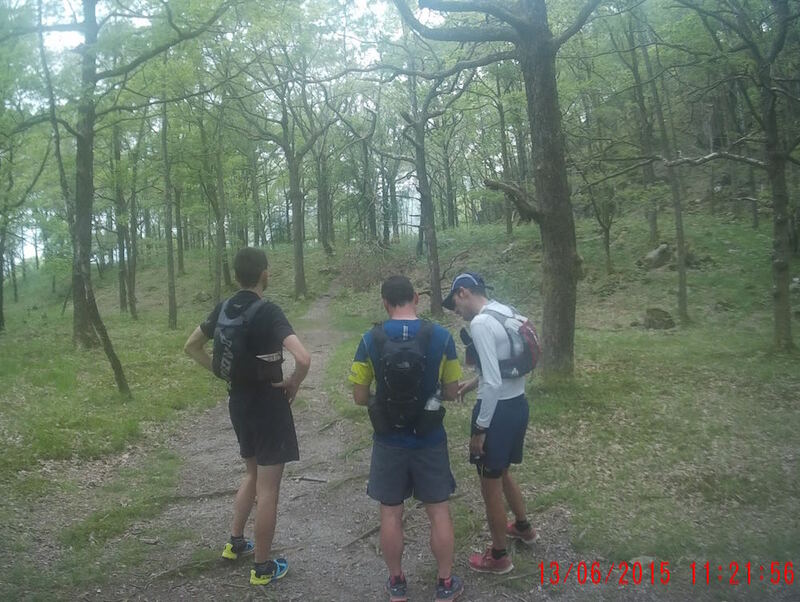 Once again we made sure Jonny led the way out of the checkpoint to help him with his navigation. Once we had climbed up out of the trees and found the right path over the 3 becks I decided to follow Marco for as long as I could. I was really pleased with how well I was moving after 7hrs. We pulled away from Dave & Jonny but I knew Marco would wait at the top so that was fine. There is a short climb after crossing each beck but then a lot of ground between the becks is runnable so I kept a steady rhythm going. Whenever there was a rise though I would walk that bit whereas Marco would keep running so it didn’t take long for him to pull away! On my mini-splits for the 3.45 miles from the checkpoint to the top of the sail pass I have 1:15:00 as my target. I reached it in 1:02:52 so it was encouraging to see I have 12mins to play with. As we waited for Jonny and Dave I asked Marco if he had a plaster as my little toe on the right room had a blister and I thought it would be good to put a plaster on so it would be okay for tomorrow. I often get soreness on that spot and sometimes put a plaster on before I run which delays the rubbing. Jonny was looking as though he had found the climb quite tough but I knew once we go on the descent he would be fine. I’ve seen it time and again on Ben Lomond. We spent the next half an hour or so deciding on what to have for our evening meal. Dave suggested a take away but Marco was keen to go to Booth’s a buy a whole roast chicken! In the end we all agreed that sounded a great idea! If it’s good enough for the Lakeland 100 winner then it’s good enough for us!! The next decision was whether to buy food as we ran through Keswick and eat before we had a shower or shower first and then go to Booths to buy the food. I won out on this one by insisting we shower first!! Katrina would have been proud of me! The path down to Braithwaite can be really tricky especially in the dark so we took out time to make sure we all knew the way. Dave explained it is the third path to the left and once on it there is a small boulder just off the path. Marco thought it was the second one so Jonny & I watched on with amusement as Marco (whose navigation so far left much to be desired) ‘discussed’ with Dave (who knows this area like the back of his hand!!). Unsurprisingly Dave was right. Dave trying to convince Marco which path is the correct one! I led the way on the descent down to Braithwaite and I was very happy to see that the others didn’t go bombing past me. I really feel I’ve turned a corner with my downhill technique and confidence. I know they could have descended faster but I felt I was running it rather than holding back. Jonny, Marco and Dave in my wake as we descend to Braithwaite!! Once we came to the checkpoint Dave rang Tracey to let her know our plans for the evening. We had about 45mins left to run. 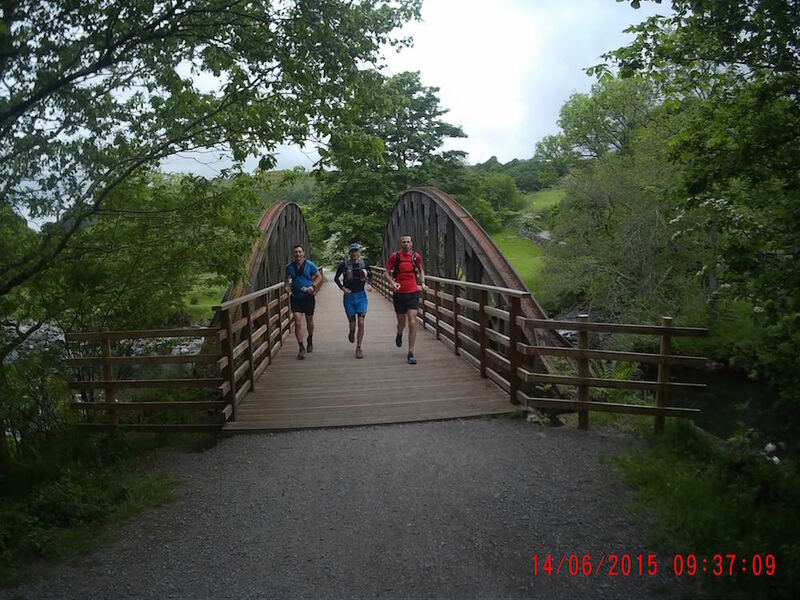 We ran along the A66 and then onto the disused railway line past Dave’s school and into Keswick. When we came to the path leading up to Latrigg Car Park we took a split as we would run back to this point in the morning to restart out journey on the Lakeland 100 route. As we ran to Dave’s house we all agreed we’d had a great day. I love being on the route. For me the recce runs are the time to look around, take photos, make sure I know the way and generally to take it all in. The race is different as I like to focus on getting round as fast as I can! Once back at Dave’s house I had a shower, downloaded my photos and uploaded to Facebook. Marco told me off for doing it so quick as he hadn’t told Debs he had finished and she was already looking at the photos! Sorry Marco. Dave, Marco & I drove to Booths and bought the food while Jonny had an extra long shower. There were two roast chickens left and they were half price. The day just got better and better. We added soup and salad and come mint chocolate ice cream. After eating far too much we headed to bed with a plan to be running at 7.30am. In hindsight I should have said 7am to Marco!! We were up and having breakfast by 6.45am but as we didn’t have a bus to catch we didn’t have to be out for a set time. So by the time Marco had packed his bag (the rest of us did ours in the evening!) we left just on 8am. 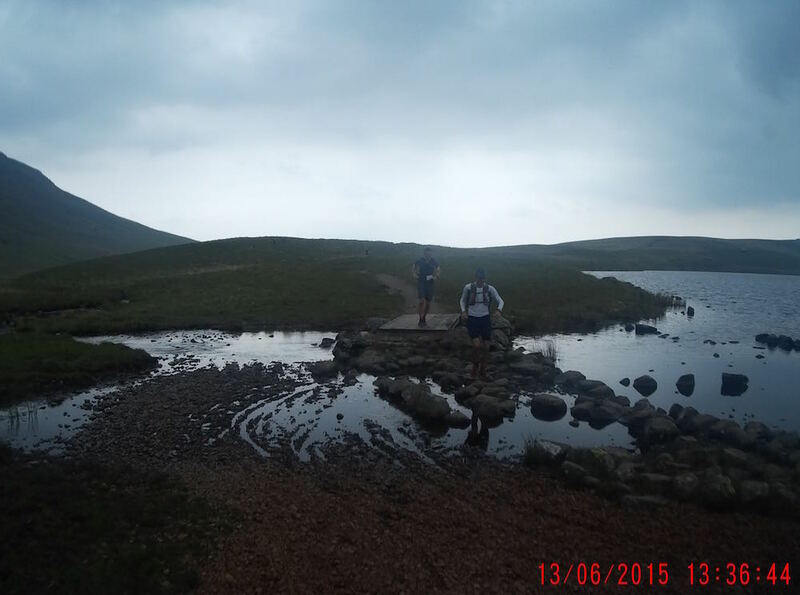 The plan for day 2 was to finish off the leg to Blencathra and run the 7th leg to Dockray. Jonny & I would then have completed the whole route. Initially I thought we could just run back along the route but then I thought Dave might have a better option and he didn’t let us down. The weather forecast for day 2 was better than day 1 but it didn’t turn out that way! On the strength of the forecast I wore my short sleeved top but really I should have worn a long sleeved. 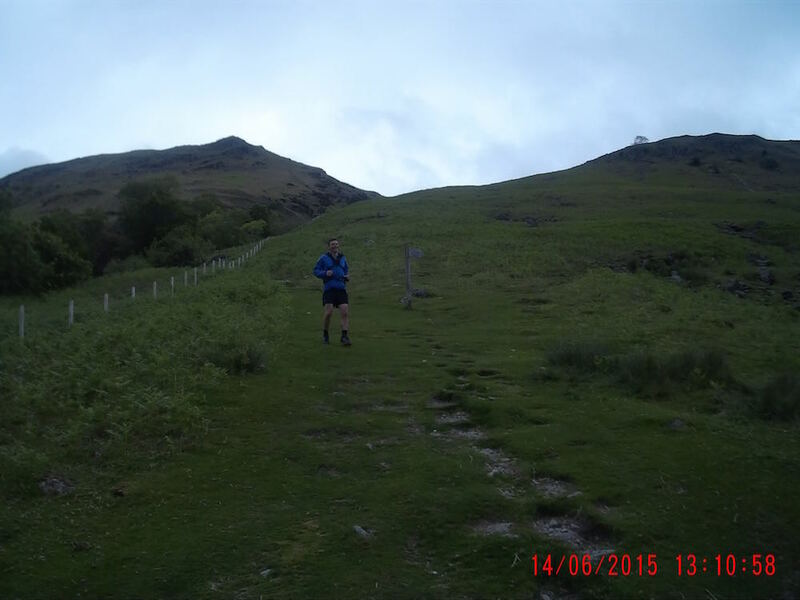 We ran back to the point where we left the Lakeland course the previous evening and then headed up to Latrigg Car Park. I was really pleased that my legs felt good. They had yesterday’s miles but I was moving easily and ready for another good day. We all enjoyed the run along the rocky path. Marco was off and away again while of us chatted about race plans and hopes for the race. What came next was the highlight of the weekend for Dave, Jonny and I!! In 2012 I missed the turn right at the end of the valley and ended up running an extra mile or so. There is a compulsory dibber to stop people cutting down early and it wasn’t were I thought it would be and in the semi light I missed it. Anyway Dave was explaining to Jonny that you can’t miss it because once you go over the only wooden bridge look out for the small stone ruin and that’s where the dibber will be and where you turn right. The path to the right is the way to go. The path ahead is the way I went in 2012!! We didn’t see Marco but assumed he was waiting for us further down so we started running when we saw Marco coming from the ‘wrong’ path. At first I thought he was having fun at my expense but no …. he genuinely made the same mistake. He said he got there too soon and didn’t think that could be it. 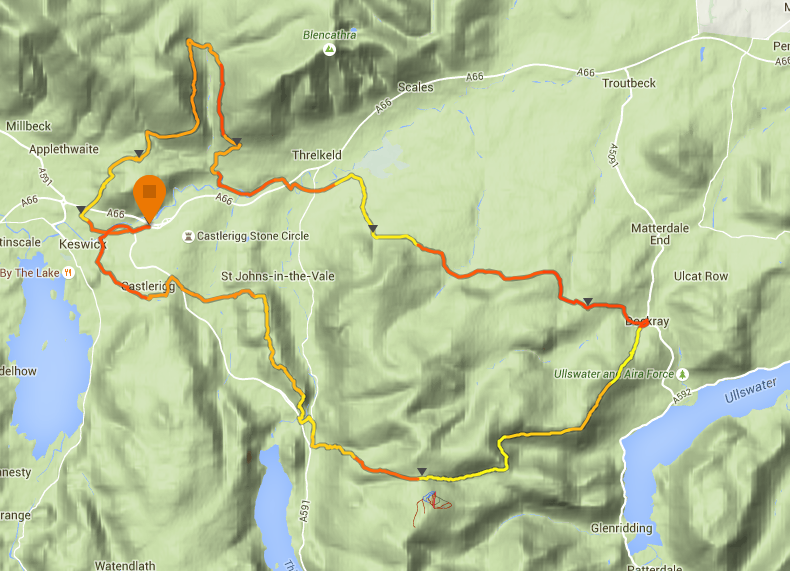 Marco’s strava trace tells the story …. 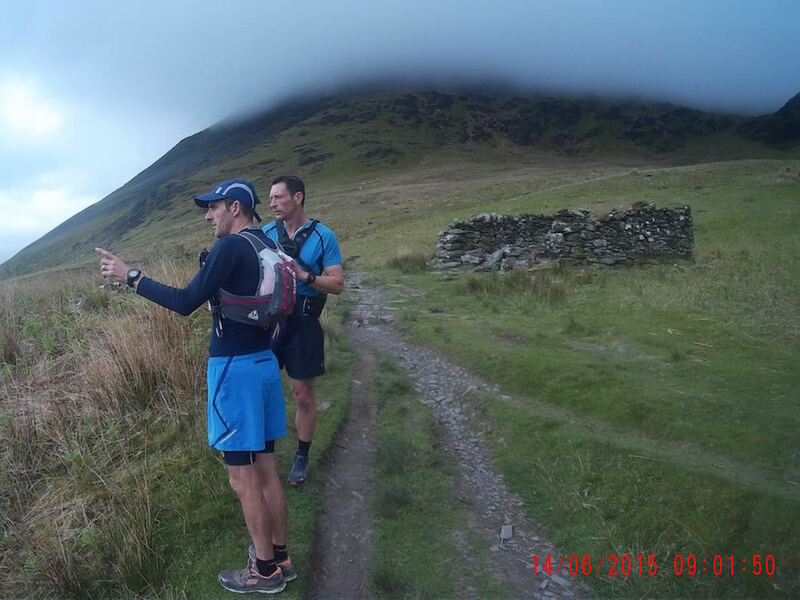 We had a good run down to the checkpoint at Blencathra agreeing that if Marco gets his navigation right and doesn’t faff around in checkpoints he will definitely go faster than last year!! 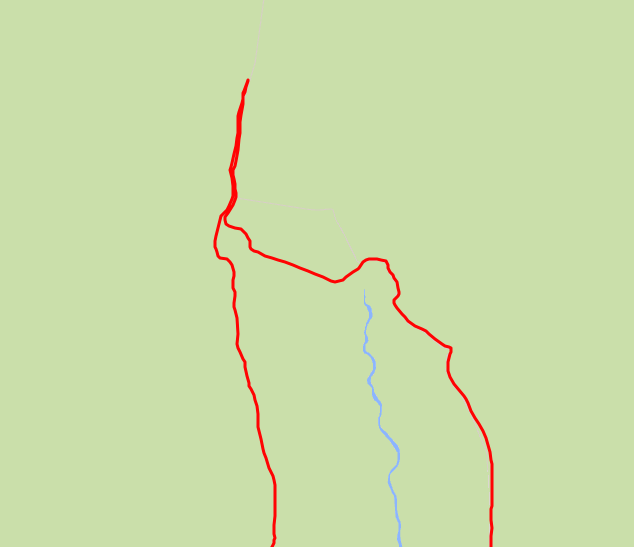 The next few miles are very runnable as the route follows the old railway line. It reminded me that if I’m running here there is a lot of time to be made. The weather was closing in now and getting quite cold. Once we left the railway track and headed up the hill to the Old Coach Road we were into the cloud and the rain. Once we hit the track we all stopped and put on our jackets as it was only going to get colder and wetter as we climbed. Marco and Jonny were leading the way and I spent the next few miles chatting to Dave. I reckon over the weekend everyone spent time with everyone which was great. Jonny was moving really well on this section which was encouraging for him considering how he felt at the end of day 1. When we reached the Dockray checkpoint Jonny & I had completed the whole route. Dave had been with us for the majority. He didn’t run the Ambleside to Coniston leg in April. I thought we need a photo to celebrate the fact! The complete circuit had taken us 25hrs 21 mins over 2 weekends. We had run 14.64 miles and Dave reckoned his route back would be about another 14 miles making around 28 or so which would be good. Dave took us down to Dockray and then we had a climb up to the ridge and then a great path skirting around the hill. 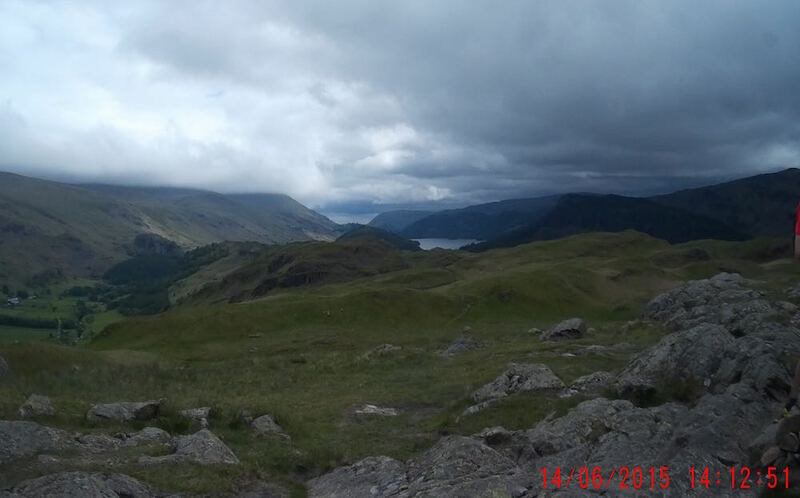 The views of Ullswater would be superb but they were not quite so good in the mist. 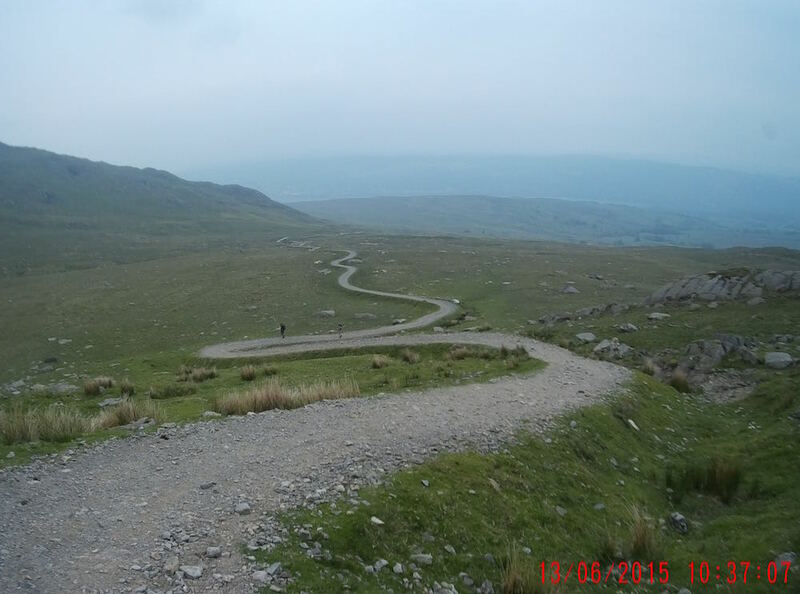 It was an undulating route with a narrow track and lots of up and down. All good workout for tired legs. The weather picked up as we descended and we had a lovely afternoon once we were down. 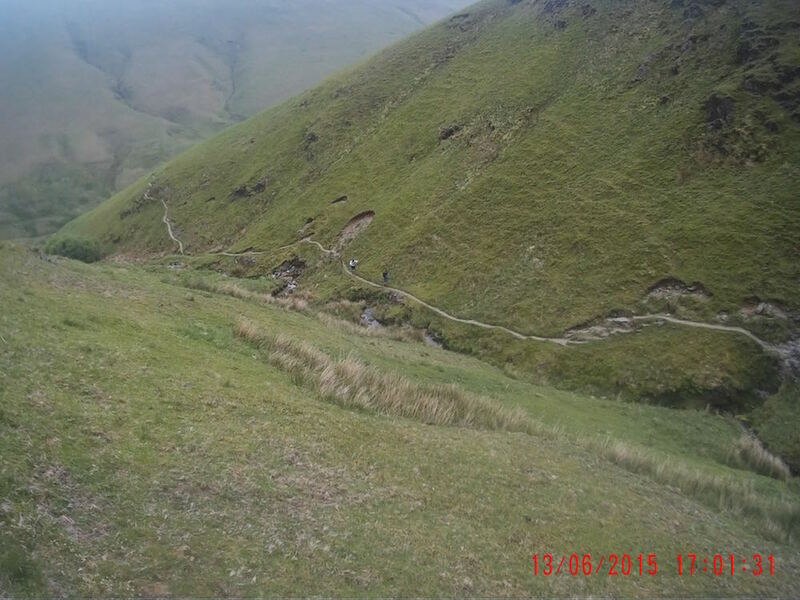 There was a long descent on grass and once again I was really pleased with how well I was descending. Jonny’s foot was sore. Initially he thought he had a stone in his shoe but it was actually his foot that was sore. 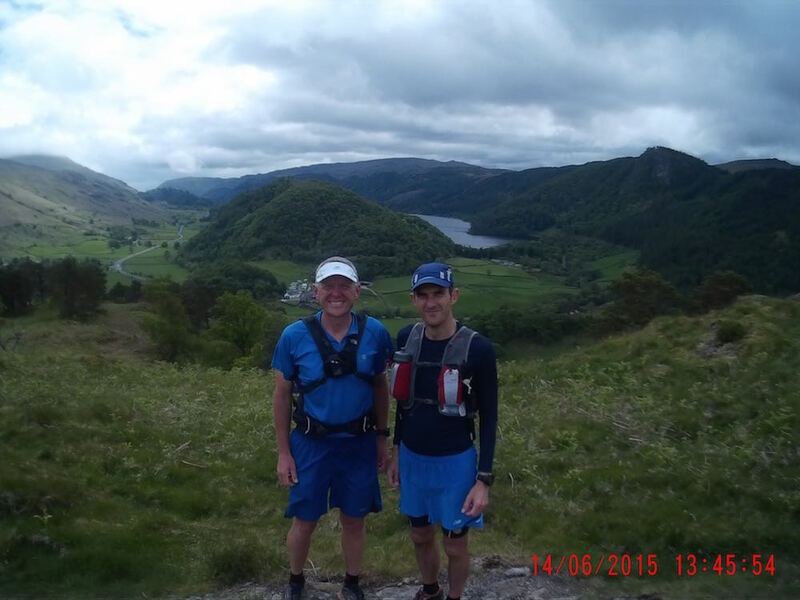 Dave gave him the option of an easy 4 mile run back to Keswick which he wisely took. There is no point in making it worse. 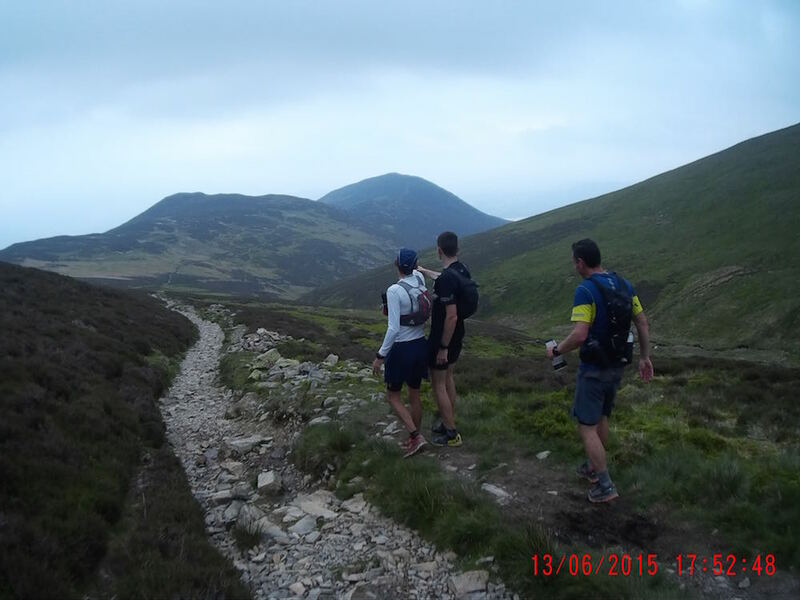 Dave, Marco and I set off back up another hill and had a lovely run along the ridge back to Keswick. The weather was clear now and we were treated to some great views. We ran into Keswick and back up to Dave’s house. We ran 29.30 miles on Day 2 making it 65.93 miles for the weekend. Probably an average weekend for some ultra runners but certainly my biggest weekend of the year! What a great weekend. Thanks so much to Dave and Tracey for your excellent hospitality. Tracey’s cheese nachos are to die for at the end of a run …. not to mention her cheese and ham toasties! Thanks for your company Dave, Marco and Jonny. I really enjoyed sharing the route with you. The next time we run together will be in less than 6 weeks on race day. Even though we won’t see each other much during the race!! Can’t wait! 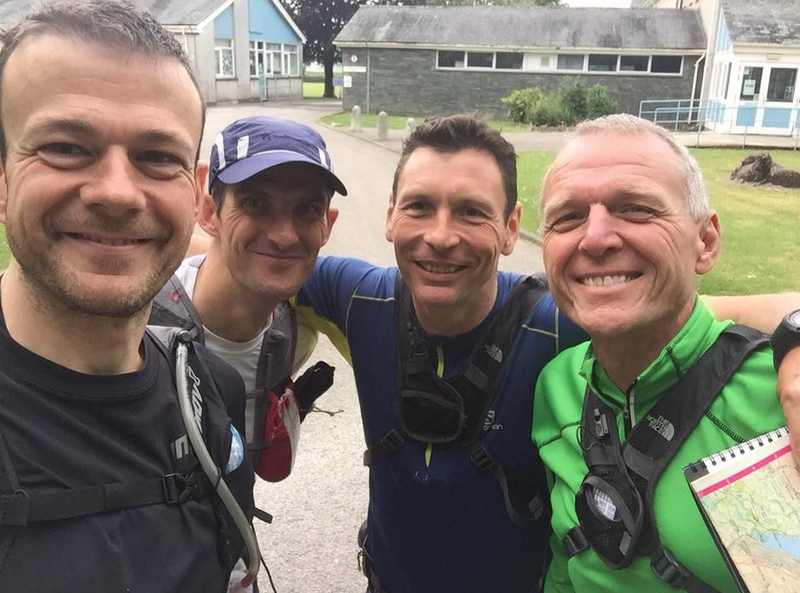 This entry was posted in Lakeland 100 recce. Bookmark the permalink. 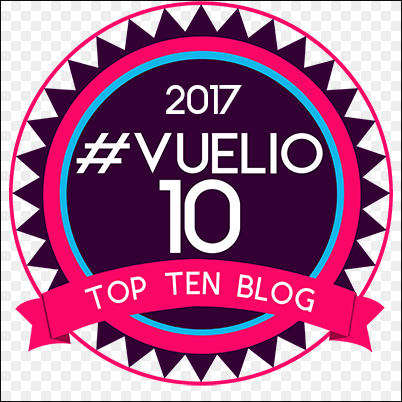 good blog JK. The worse thing was that during the race I went wrong just as much. Oh well – that’s what recce runs are for. Learning the route. Regarding the first and second stile though – last year there was only the one style but when I was there in November they had put up the new fence. Thanks for a fab weekend. Really enjoyed it. Great reading – what was your average heart rate for the days? I didn’t wear a HR strap for these recce runs so I don’t know! I will be wearing one for the race though! 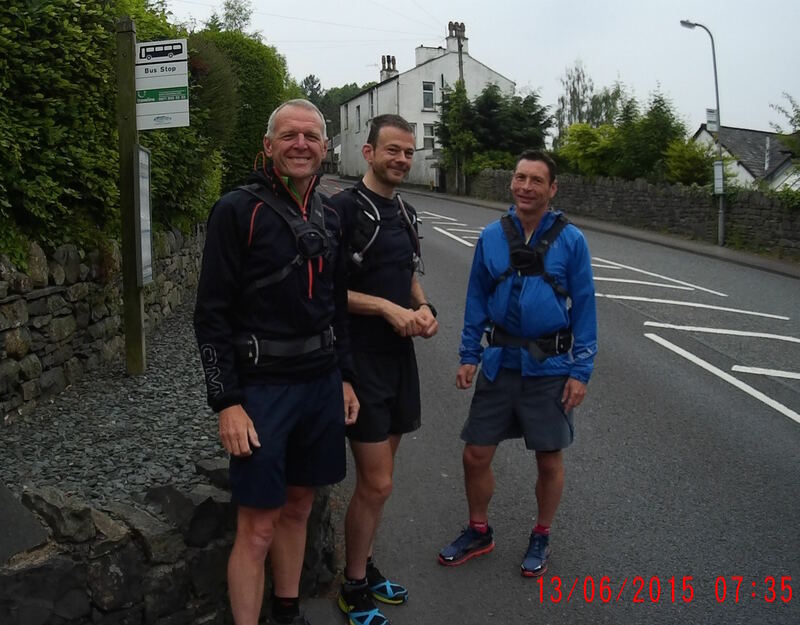 OK thanks – I’ll be doing Coniston to Braithwaite on Saturday with HRM limits at 125-145 aiming for 135 average. 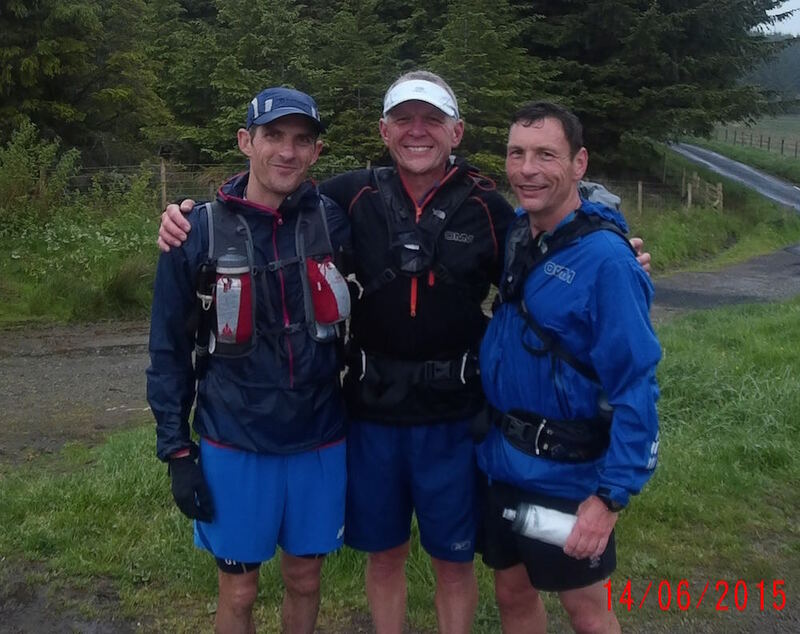 BTW we met briefly last year at the Skiddaw 50k – I was with Andy Cole. Hi John, looks like you’re in good form! It will be good to see how your heart rate pacing goes. One of the talks at the last ” official” recce was by Ian Boardley who is a sports psychologist as well as having run the race 3 times. He was advocating a similar conservative strategy, though not governed by HRM but just a strategy of walk/run on the flats and going easy on the descents. 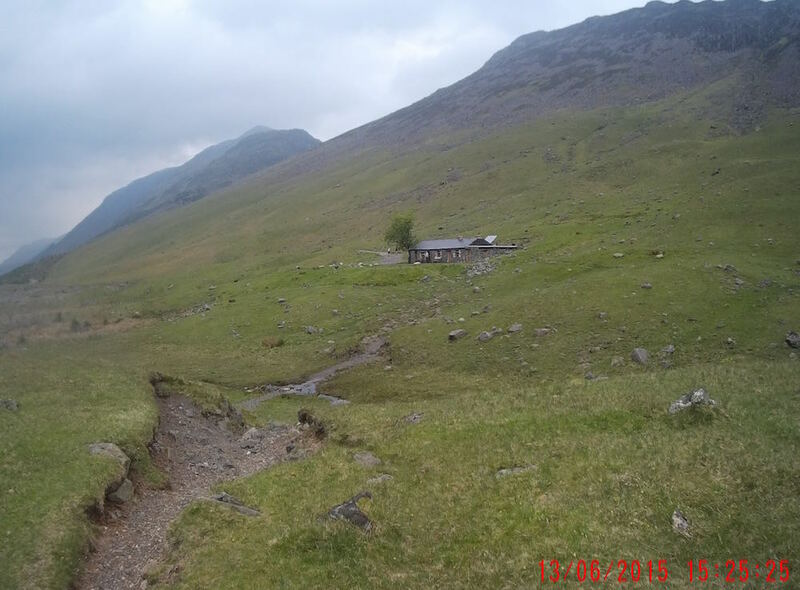 His splits from 2013 are interesting, take a look at the site, but for example he was in 263rd place at Seathwaite, didn’t get into the top 100 until Braithwaite, and finished 25th in 27hrs54 – just about your target! See you at Coniston. I looked at the slides from Ian Boardley and thought it made a lot of sense. I would certainly take his splits!! I’m really looking forward to seeing how it works this year. Last year in the Hardmoors 110 I ran to a HR of 124 and it really helped me early on to reign it in and finish strong. 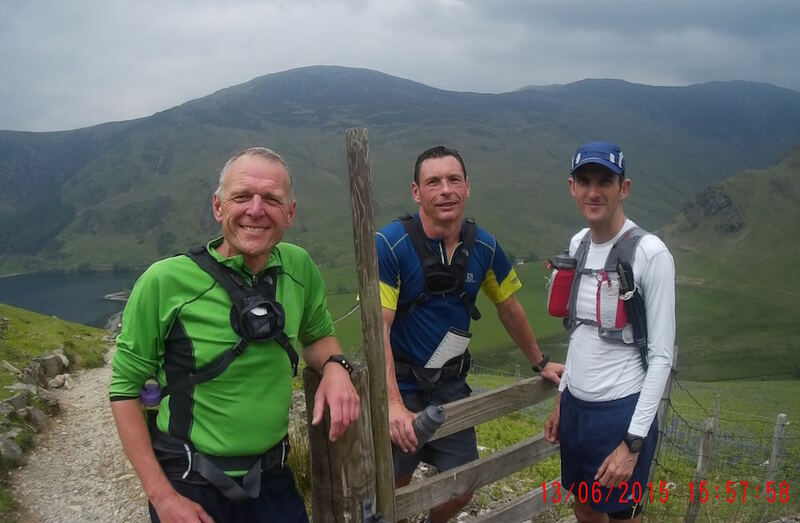 Thanks Andy – very very interesting about Ian Boardley’s splits – I’m back at L100 this year after I dropped at Buttermere shortly after you and Sharon and I went over black sail last year. I will be strictly on a monitor this year. John Gilbert. Hi John, great account of your training run – as always. My running partner Andrew Howells and I met you during the L100 in 2012 just after your unscheduled detour at the head of the Glenderaterra valley, so it put a smile on my face when I read that this section can still catch even the best runners! Best wishes for the rest of the training and for the event. I look forward to reading all about it! Great to hear from Andy. Hope you are well. I was chatting about how you two helped me deal with my mistake! I’m determined not to take any detours this year! Are you running again? Hi John I’ve taken a couple of years off the Lakeland. Last year to focus on UTMB and this year to encourage some others to take up ultras. But I’m thinking about next year- I’d still like a sub-30 finish!